Discover what actually happens throughout your ovulation cycle (also called menstrual cycle or reproductive cycle). I'll take you step by step starting with Day 1 (the first day of your menstrual period) and end with the last day of your cycle, just before your period starts again. Your menstrual cycle is split up into two phases. 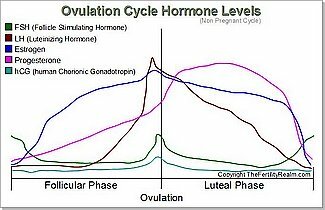 The follicular phase is the first half of your ovulation cycle and the luteal phase is the second half. Your menstrual cycle length is the total of these. Your follicular phase starts with the first day of your menstruation period and concludes the day of ovulation. This is when your follicles are preparing an ovum (egg) to be released from the ovary. 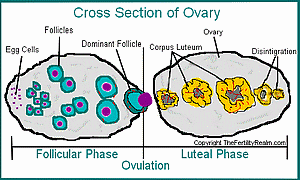 (Ovarian follicles are what produces your eggs. These follicles grow within your ovaries) The length of this phase varies from woman to woman and even cycle to cycle. Several hormones dominate the follicular phase of your menstrual/ovulation cycle. FSH (follicle stimulating hormone) is the hormone that signals your ovarian follicles to grow. Actually, FSH starts to rise just before your period. As progesterone drops, which signals the end of your previous cycle, FSH levels rise in anticipation of a new ovulation cycle. Cycle Day 1 is the first day you have red blood and is more than just spotting. So if you are only spotting, than this is not considered Day 1 of your ovulation cycle, yet. Your menses starts when the hormone progesterone production level drops from the end of your last menstrual cycle. This drop signals your uterus to shed its lining and you get your period. As your eggs begin to grow and mature under the influence of FSH, they start to produce estrogen. Estrogen is a hormone that signals your uterus to prepare for conception. Thickening your endometrium (endometrial lining of the uterus) to prepare it for implantation of a fertilized egg. Estrogen also governs the cervix and thus the cervical mucus that it produces (among other signs of ovulation). As this hormone level rises your mucus will become thinner. This fertile mucus is necessary to allow the best environment for sperm to travel up into the fallopian tubes and be nourished while it awaits the release of an ovum (egg) from the follicle. During this time of your fertility ovulation cycle, there is a kind of race between your ova (eggs) to be the one released. As estrogen begins to peak, this in turn signals the release of the hormone LH (luteinizing hormone). LH tells your follicles, the dominant follicle, to release an egg. And this is 'ovulation'. This is the hormone detected by an ovulation predictor kit ( OPK ). In a typical 28 day cycle, ovulation usually happens on Cycle Day 14. This, however, is a myth for most women. When you ovulate depends on several different circumstances. And can occur, for example, on Day 10 or less. Or on Day 30 or more. The luteal phase is the second 'half' of your ovulation cycle (this is often referred to as the two week wait). The time from ovulation to the beginning of your menstrual period. This phase is usually consistent from cycle to cycle, unlike the follicular phase which can vary sometimes widely. 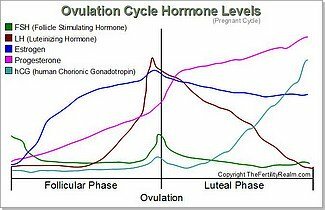 So if your luteal phase is 14 days long it will almost always be that long, give or take a day. Though the length of this part of your menstrual cycle can be slightly different from woman to woman, it generally varies from 10 days to 16 days. Two weeks or 14 days is generally typical and is why it's generally called the two-week-wait or 2WW. The 2ww is the time after you ovulate to the time your period starts that you have to wait to see if you succeeded in getting pregnant. Pregnancy tests usually won't work until the end of the luteal phase. Though some work sooner than others. 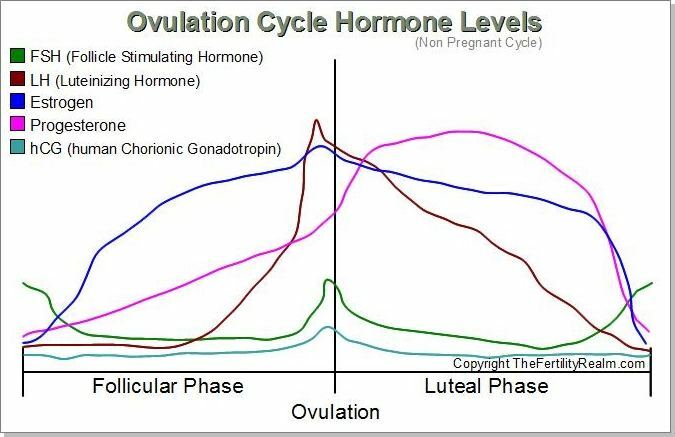 If you notice that the luteal phase of your ovulation cycle is shorter than 10 days, you may have a luteal phase defect. Fortunately this is easy for most to correct. Once you have released an egg, progesterone levels will begin to rise, along with your basal body temperature. Progesterone becomes the most dominant hormone in this second phase. It further prepares and nourishes your uterus for implantation of a fertilized egg. Human egg fertilization takes place in the fallopian tubes and occurs within 24 hours of ovulation. This is also considered the moment of conception. The corpus luteum governs the release of progesterone. Once the egg is released from the dominant follicle, this empty follicle becomes the corpus luteum under the influence of luteinizing hormone, thus the name luteal phase. After fertilization, the embryo travels down the fallopian tube to the uterus. This is where pregnancy implantation takes place and you are officially pregnant. The embryo burrows into the uterine lining and starts to produce human chorionic gonadotropin (hCG). This is the 'pregnancy hormone' that is detected by pregnancy tests. If the corpus luteum receives the signal from the hormone hCG that the egg has been fertilized and has implanted, it will continue to produce progesterone and estrogen. Click here to discover more about natural progesterone cream. If it doesn't get this signal, then it will begin to die and stop producing progesterone. This drop in progesterone then signals your uterus to empty its contents, the endometrial lining. And your period starts. And your menstrual ovulation cycle starts all over again.